DesignBoom has a great post this morning on Concrete Blond at Designersblock ~ Instead of wallpapering a concrete wall, they apply the wallpaper patterns through texturing the concrete… and the result is a mesmerizingly beautiful unexpected result. More images below both from Design Boom and Concrete Blond. Firstly, it cracks me up that they say its for men. Is that sexist? Either way, just b/c its nice and minimal should not make it manly. I want it. It screams calm, organized, and controlled to me. Check out more images below, as well as the full press release with more of their justifications on how this is male oriented and the various materials used and the history of the companies collaboration. What to do with all of those retro toys laying around? Well Ken Keirns seems to have found the perfect use for these Fisher Price Toy TV’s (a little ebay research shows that these are from the 60’s and tended to play a few songs when buttons were pushed ~ and bids are all under $10 ~ often even under $5!). After the jump are a few of Ken’s pieces which showed at the Hot Babes In Toyland Show 2007, Chicago, IL. Above are two that will be part of Subtext’s “The Witching Hour” show which is opening on October 5th. The novelty of seeing NOTCOT in print has still yet to wear off. It makes me giddy ~ maybe thats showing my age, but print still has that effect on me. HUGE thanks to Corey who emailed in while i was in Philly that NOTCOT got a tiny mention in the October 2007 issue of Entrepreneur - Rumor Has It section… managed to snag a copy while waiting around for hours at the Philly airport. No i’m not one of their Young Millionaires (yet. at 24, i’m running out of time i suppose though! )… but designer Ren Moulton (seen cozying up with his chew toy) did list us as one of the product blogs he visits! And it was in bold print in a larger font… so as tiny a mention, it’s big in its own literal way. While on the perfect ties for my guy hunt… while writing up that last bit on Prep & Pauper… i was discussing with a friend some of our favorite ties, and got reminded of Psycho Bunny… which of course had me hunting over at NotCouture to find it (#062! ), and then i discovered NEW Psycho Bunny ties at Neiman Marcus! How NotCouture is that saftey pin one? 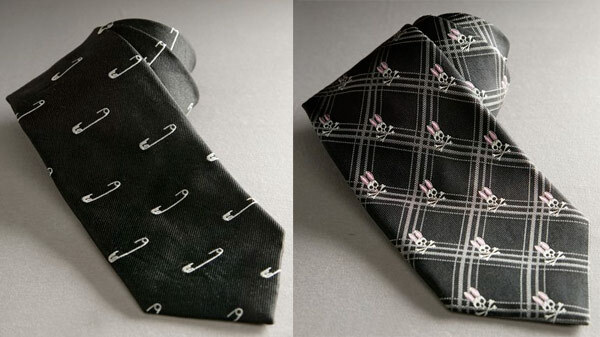 I love their classic bunny skulls, but the safety pin tie is my new favorite tie of the moment. More pics below of the classic minis, and the striped. Prep & Pauper ~ As part of the super crafty philly trip (it seemed like an etsy-fest). One of the local designers we dined with was Nicolas Newbold who is part manny (yes, male nanny), construction worker, ex-PR NYer, kid who ran around in a lacoste polo with the collar popped while sporting vans and a skateboard… etc etc etc. You get the point. He also has an obsession with ties, from patterns to silk weights to thicknesses… so as a company that started with a name and no purpose, Prep & Pauper naturally became a tie line. Interesting random tidbits to note before jumping into the overdose of pictures below? He claims to lack the ability to draw, but has hand drawn and learned illustrator to master all of these doodles seen on the ties ~ sews each and every bag by hand, and tapes them shut just for you. AND? I have a sneak peak for you of his upcoming Wailer print. Also, for all of you who are big on ties, let me know what you think of his patterns compared to those like Vineyard Vines, J.McLaughlin, Hermes, etc… because the comparisons keep coming up, and pulling up some of those they do seem a tad similar. Click the images to see more! Here are some of my personal favorite from NOTCOT.org ~ those laptop sleeves by Working Class Heroes actually made me give in and register on Etsy to buy two… (more on that soon probably, they are my obsession of the night having just gotten back to LA from Philly). Also Marian Bantjes post on her latest work: the Saks Fifth Avenue “Want It!” Campaign… is the most adorably inspiring post i’ve seen in a long time, not to mention the work itself is incredible. Her calligraphic pieces showed up in everything from emails and brochures, to window displays, carpets, and 3d sculptures. Click the images to see more! While rounding things up ~ here are some of Shade Elaine’s choice picks from NotCouture! Derrick Cruz of Black Sheep & Prodigal Sons and THECAST collaborated on a series of handmade accessories for their Spring/Summer 2008 collection. Picking up on Black Sheep & Prodigal Sons’ love for “Dark and Uncommon Goods” and THECAST’s edgy basics, the collaboration brings to mind a refined Wild West - accessories for the urban cowboy, perhaps. 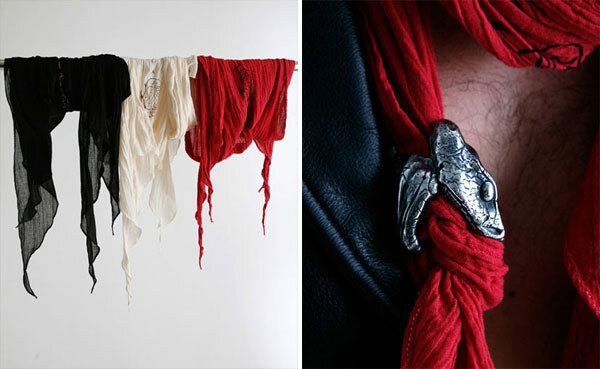 Shown above, the Cottonmouth is a solid metal snake bolo on a hand-screened gauze scarf. 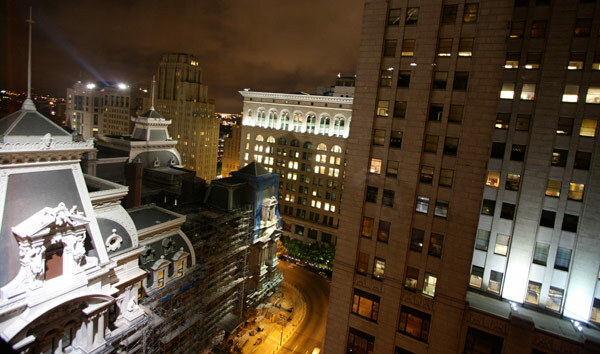 I forgot to mention why i’m in philly for the weekend ~ i was invited by the Greater Philadelphia Tourism Marketing Corporation (what a mouthful) for a weekend of Philadelphia Architecture, Fashion, & Design. And to be honest i haven’t spent much time at all here, so should be an interesting exploration of the city. 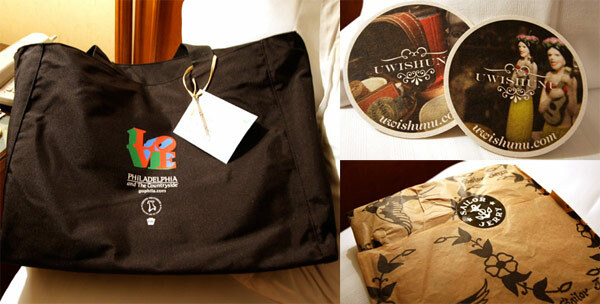 Since i’m quite spent, and don’t have energy to share the itinerary at the moment, how about i give you all a peek at the goodies in the welcome bag, and some of the great packaging the designers used? My usual quick hotel bed photoshoot style pics below! On strange days ~ i woke up at 6am in LA, jumped on a flight at LAX by 9… didn’t take off for well over an hour after that (which was a result of mechanical issues, followed by what i only later found out to be a 30 min delay b/c VP Cheney was taking off at the same time)… end up hanging out at the airport in philly for a while, end up on a shuttle full of dieticians… then find myself at the gorgeous Rae Restaurant at the new Cira Center… and now i’m curled up in a big plushy bed at the Ritz Carlton Philadelphia. So before i can process everything, here’s a random post to show you the bizarrely lush world of the philly ritz around me right now… things to note? The over the top Chocolate Thursday Nights… with a lobby filled with choc fountains, etc. And this cloud of comfiness of a giant bed to work from. And the beautiful glass dome in the lobby. Acca Kappa ~ an “Italian legend of luxury” ~ upon walking into the store at Century City i was told that this ancient brand was used on the royals. But what really drew me in was all the beautiful use of various woods (i’m a sucker for wood bristle combs… since my ancient Aveda paddle brushes as a kid, to the various Koh-i-noor ones i’ve recently used)… and their men’s line! 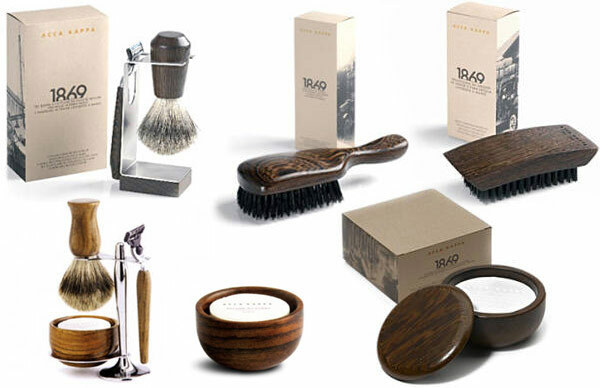 Made me wish i was a guy so i had a good excuse to buy the “1869 Series Shave Bowl & Soap: Hand made bowl with East African Wenge Wood contains vegetable-based Almond shave foam” from their men’s 1869 line. I don’t think you fully understand how beautiful that bowl is! And the curvature of their nail brushes were amazing too (also the soap dish you can see below). They have hair brushes in both the darker woods as well as the lighter hand finished beechwood… and new to the store was the extremely eco friendly Bioceta line of 100% biodegradable line of hair brushes, nail brushes, body brushes, etc… they are made from a unique cellulose that is extracted from cotton. Anyhow, i was quite taken by the line, and i think the 1869 men’s line is definitely on my shopping list for the guys this year… as usual lots of pics from their site as well as some of the actual store (the store girl was nice enough to let me take a few! ).